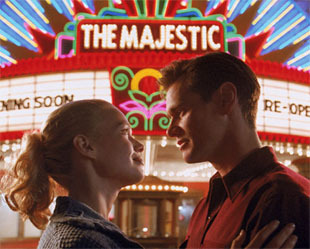 Jim Carrey looks to revisit his role in The Truman Show with this light-hearted drama about a blacklisted writer who loses his memory and is mistaken for a World War II hero in a small town. Directing this film is Frank Darabont, helmer of the critically-acclaimed and fan-embraced The Shawshank Redemption and The Green Mile. While this movie will surely be light in tone, it will also most definitely have its poignant side. It's difficult to forecast what this movie can make without first seeing some footage and without having an idea of what the ad campaign is like. Both The Truman Show and The Green Mile had quite somber premises and similar ad campaigns, but one of them opened to $31.5 million and the other opened to $18 million. Other than running time, the main difference between how both movies were presented was the light-hearted feel presented by The Truman Show. Nevertheless, the success of Truman was quite surprising, especially considering the film is mostly a drama. So the key thing is to look for the marketing strategy.